Today on Mass Appeal we are going to show you how to make your dolls look good as new AND show you how to make an easy collapsible DAY SPA for them to be pampered in! Doll hair is made of synthetic plastic or nylon fibers. Here are a few methods to make your doll’s hair look like new again. Cover doll’s hair in dangling conditioner and let her sit for 1-3 hours covering her head with a plastic bag or saran wrap. Then, comb out her hair starting at the ends so you don’t pull the plugs out or make the frizzies worse. Use a plastic brush with straight bristles, not a brush with nubs on the ends, as that will snag the hair. A pet brush works the best if you don’t have a doll brush. Then wash out with hot water. Put few drops of DAWN DISH SOAP in your hands and run it through the dolls hair. Next, heat a mug of water until it is near boiling. (Be sure to let an adult help you so you don’t burn yourself.) Soak the doll’s hair in the hot water and count to 5. Be sure you dip it a few times, swirling the hair around under the water to make sure all the dish washing soap is out of her hair. Take the doll’s hair out of the hot water and set her on a wash cloth. Add a few DROPS of leave in conditioner and comb the hair out. Then soak it again it SUPER HOT water. Comb the hair out and style as you wish. LET IT DRY OVERNIGHT. Your dolls hair should look like new! 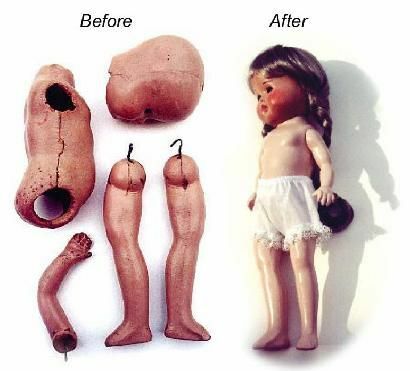 DO NOT — USE THIS METHOD ON AMERICAN GIRL DOLLS. It will ruin their hair! This method works wonders on doll hair that is so matted and frazzled, you are thinking of throwing the doll away. After soaking, take the doll’s head out and dip it in near boiling water. Dip a few times swirling the hair around in the water each time. WATCH the hair and make sure it doesn’t melt or shrink! Never leave the doll’s hair in near boiling water. Only dip it! STYLE NOTE *If you want the doll’s hair curly, put the hair in pink foam rollers. If you want it straight, Comb it out under the hot water. Once you have dipped it a few times and the fabric softener is washed out completely, comb out the hair with a plastic doll brush or a metal pet brush. If you have pink foam rollers in the doll’s hair, leave them in and let the hair style dry over night. Once the hair is dry you can style it the way you want. If it’s too curly, pour hot water over the head to loosen the curls. When you want to clean a vinyl doll, first give her face/body mask of lotion and let it set for an hour and remove it with baby wipes. Wipes work great for between fingers and toes. This removed old dirt. I use this as first step when cleaning thrift store dolls. Take a damp cloth and pick up a little baking soda. Scrub the doll’s skin to remove dirt. This abrasive natural cleaner works great for doll skin but be careful around the painted face. After scrubbing the doll with baking soda, give her a bath in DAWN. It works great to get sticky residue off and remove any oils from your hands that trap dirt on the doll’s skin. For extra stubborn dirt marks and mystery stains, use a dry Mr. Clean Magic Eraser. You can also get it wet if needed. If you doll has ink marks or green ear from age, you can easily bleach them out with acne medicine that has 10% benzoyl peroxide in it. Just cover the doll with a towel so the rest of her body, hair and face are not showing. Take a q-tip and cover the mark with the acne cream. Set the doll under a bright lamp or preferably in the sun. This step takes patience. It may take few treatments to bleach the stain out completely, but it does work. For a speedier method use Remove-Zit from Twin Pines of Maine. They have professional doll care products. To remove nail polish marks, use non-acetone nail polish remover. Be sure to use cotton balls and q tips and be careful. Be sure to rinse the area with warm water to stop the chemical process. To remove factory paint to repaint the face, aka “Face-Ups” use acetone nail polish remover. Only use on the face, as it will permanently melt or discolor the plastic on the doll’s body. Cut two pieces of foam board 5-10 inches taller than your doll’s head. You can cut the shape of a house or a castle or a ship, as long as the bottom is flat. Take a ruler and a pencil and draw a line down the middle of both pieces of foam board. Draw a dot in the center with your pencil. Take a pair of scissors and cut the first foam board from the bottom up. Stop where you marked the center dot. Then cut the other piece of foam board, only start from the top and cut down to the center dot. This will allow you to put the house together and it will stay sturdy without glue. Take paper, fabric or wall paper and cover the walls. You can use old jewelry, buttons and household items to decorate your house. You can cover small plastic bottles with paper to use as stools and table bases. You can cut out photos of furniture, mirrors, etc from magazines to make your house look more realistic. Use your imagination! The sky is the limit! Pull the top board up and store the house flat until the next time you want to play! *Used costume jewelry can be purchased for $5 a bag at Fancy That Antiques. Anyone who wants the display house from this segment can go to Fancy That Antiques at 2805 Boston Road Wilbraham, MA 01095. It will be available for pick up after 2pm today. Call or text 413-512-3714 if you want to speak with Malena for help with your Dolly Day Spa!